Amazon reported standout third-quarter earnings Thursday, but revenue and revenue guidance disappointed. Shares were set to open down almost 9% on Friday. A drop of that magnitude would have the stock down more than 20%, putting it in a bear market. 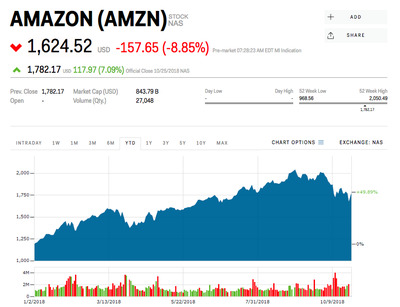 Amazon was set to plunge at Friday’s opening bell after the company delivered disappointing third-quarter revenue and fourth-quarter revenue guidance. The e-commerce giant delivered standout third-quarter earnings of $US5.75 a share on Thursday, easily beating the $US3.11 that analysts surveyed by Bloomberg had forecast. Its revenue of $US56.6 billion, however, missed the $US57.1 billion that was expected, and its fourth-quarter revenue guidance of $US66.5 billion to $US72.5 billion also fell short. “AMZN posted generally positive Q3 results-In-line Revenue with the highest Gross Margin we have seen in any third quarter & record high Operating Margin,” a team led by the RBC analyst Mark Mahaney said in a note sent out to clients after the results. And while things may still look good for the company’s future, the past two months have been difficult for Amazon shareholders. On September 4, the company became the second in the US to reach a $US1 trillion valuation, setting a record-high share price of $US2,050.50 that day. But that day signalled the top for the stock, and shares were down more than 13% through Thursday’s market close. If Friday’s premarket drop of more than 9% were to hold up, the stock would be down more than 20% from its peak and officially in a bear market.